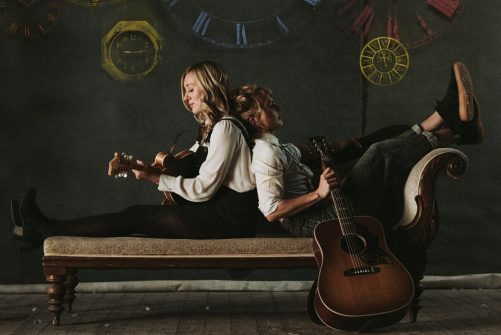 It’s easy to warm to Abbe Martin and Hannah Wood, the singer-songwriter partnership known as Sound of the Sirens. Their passion for their craft, great sense of humour and positive outlook on life permeates everything they do: from their outstanding studio records, light-hearted music videos, and broad-reaching headline tours, to their activities away from music, such as the running that has seen them raise thousands for worthy charities. Their balanced, holistic approach to artistic life has yielded some fantastic songs, which we’re looking forward to hearing upon their return to Manchester on 28th March. Having sold out The Eagle Inn last year, we’re thrilled to be welcoming them to Band on the Wall, supported by local lad and outstanding songwriter, James Holt. Ahead of the show, Abbe and Hannah told us about their desire to get their trusty touring van into a music video before its motor ran out, how their songwriting process has developed and how they’ve come to appreciate buying second hand clothes. How has your songwriting — and the ways in which you write — developed since you made your first album? Have you discovered an ideal sort of place to retreat to in order to induce creativity or stimulate new ideas? Your new video for Awakening has captured people’s hearts and tickled their funny bones. Where did the video idea begin and how did you pick the pairings you depict? You’ve done plenty of running for good causes in recent years, raising over £4,000 for MIND last month. Given how divisive running can be, some loving it and some hating it, what do you love about it? What led you to choose MIND as the charity to raise funds for? Your vocal harmonies are a cornerstone of your sound and a beautiful feature of the new album. Does harmonising and the arrangement of vocal parts arise naturally, or is it something you sit down and work out theoretically? Having seen you tweet about refillable drinks bottles in the past, what are your thoughts on Glastonbury festival outlawing the sale of single use plastics? Have you come across any other cool, environmentally-friendly ideas that you’ve worked into your lives recently? What’s the most impressive or unusual place music has taken you, thus far? Is there anywhere you’re yet to visit that you’re hoping your work may take you to?